The star of the award-winning TV show, Ask Dr. Nandi, which reaches over eighty-five million US households, empowers readers to become their own health hero. Dr. Partha Nandi delivers passionate, empathetic, and trusted health advice daily to over eighty-five million US households, is seen in ninety countries worldwide, and his Facebook videos have been watched by more than 1.5 million viewers. In a sound bite culture, Ask Dr. Nandi disrupts the status quo by engaging viewers with in depth discussions on the health and wellness topics that matter to their lives. A health hero means being an advocate for yourself and your family, in sickness and in health. It’s about building the confidence to gain knowledge and use that knowledge to make tough decisions. In Ask Dr. Nandi, Dr. Nandi gives readers the necessary tools to become empowered and take ownership of his or her health choices. Whether addressing bullying or prostate cancer, community and purpose or fitness and nutrition, Dr. Nandi tackles the tough questions, stimulates conversations, creates a new awareness of options and resources, and guides readers to confidently make the choices that are best for them. Dr. Partha Nandi is a full-time practicing gastroenterologist, internal medicine physician, and Health Hero activist. His warm, friendly, and knowledgeable demeanor makes him accessible to all. He has his own TV show, Ask Dr. Nandi, a medical lifestyle show whose mission is to improve the health of America and the world with compassion, empathy, and integrity. Airing on seven networks, in eighty million homes in the US and in eighty countries, The Dr. Nandi Plan has become a global success. Dr. Nandi’s approach to discussing health care, fitness, nutrition, and lifestyle not only incorporates compassion but also a sense of community, purpose, and most importantly spirituality. Dr. Nandi walks through the five key pillars that we need for happy, long lives. Instead of focusing on one disease or ailment, Dr. Nandi gives us a total, holistic prescription to live to our fullest potentials. Ask Dr. Nandi is powerful for two reasons. First, his advice about finding and cultivating your tribe is compelling. Too often, the connection with other people in our communities is lost today in our busy, online world. Second, Dr. Nandi offers simple techniques to become more mindful and incorporate meditation into our daily lives. Guided by this book, anyone can live a more joyful, health-minded lifestyle. Dr. Partha reaches over 80 million people daily with his wildly popular television show, Ask Dr. Nandi and now you can bring his powerful advice home with his book. He outlines his simple yet comprehensive plan to uplevel your health and your life. Learn why millions rely on Dr. Nandi daily for their health. Ask Dr. Nandi is a simple, thought-provoking plan that will bring best practices for healthy living into your home. Dr. Nandi and his family have dedicated themselves to teaching us how to stay out of the doctor’s office with simple, doable lifestyle adjustments. This book is an inspiring blueprint for anyone who wants to lead a long, healthy life. Dr Nandi has impressed me on so many levels. His true passion for health and his ability to inspire those around him makes him such a great role model to so many. In his book, Ask Dr. Nandi, he identifies five areas we can focus on to diminish stress and inflammation, add purpose and belonging, and put clean foods into our bodies. By simply paying attention and making a few lifestyle changes, you can add so much to your days – more friends, more fun, stronger communities and a longer healthier life. — Kellyann Petrucci, M.S., N.D., author of the NY Times bestselling book Dr. Kellyann’s Bone Broth Diet and Dr. Kellyann’s Bone Broth Cookbook. Joining the ranks of Deepak Chopra and Oprah Winfrey - Ask Dr. Nandi is game changing in it's simplicity! You will learn the elegant ways to harness the magic of being alive: food, movement, belonging or “tribe”, a sense of purpose, and room to reflect and develop a life of the spirit. Develop all five and thrive. Learn how to enfold family, friends, colleagues and community to become a #HealthHero, one of a small percent of the population that knows how to really live. Devour this book and put it to work! When you do, the promise is nothing less than deeper, richer, healthier, longer days on Earth. — Teresa de Grosbois #1 International Bestselling Author President, Wildfire Workshops Inc.
Dr. Nandi is one of the most brilliant board certified physicians, and integrated health thought leaders in the world today. As the world's Dr. — from Dubai to Detroit, his advice is trusted by leading institutions and individuals around the globe. Dr. Nandi sets the bar high, by bringing back the lost art of having a "good bedside manner." His wisdom teaches us, that not only is the doctor-patient relationship vital, but all relationships are sacred. This doctor knows best, that integrating movement, good foods, and healthy attitudes, with a sense of belonging in a supportive circle of family, friends, and community, is the real way to keep you heart healthy; both the one that beats, and the one that loves people, life, and yourself. Dr. Nandi's new book is not your typical stuffy medical advisory. We all know we should eat our peas and take care of ourselves. This new book, written by a real #HealthHero, brings us joy, through simple ideas to help you harness the magic of being alive! His "Five keys to human health," are the right medicine! Read this book. Think about it. Put it to work in your life. If you do, the promise is nothing less than deeper, richer, healthier days on Earth. If you want the most health benefit, with the least effort, this book is for you. Ask Dr. Nandi and Health Heroes are brilliant brands for today - a time when "high touch" is needed even more than "high tech." Partha Nandi is going to impact more people's lives with his platform than anyone prior and I am thrilled to see that. 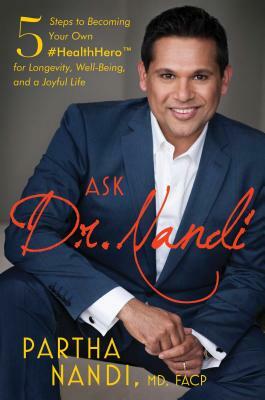 Dr. Nandi's new book, Ask Dr. Nandi 5 Steps to Becoming Your Own Health Hero for Longevity, Well-Being, and a Joyful Life is a lively informative and practical owners' manual for living a joyful life, fueled by purpose. Partha is a dedicated physician as well an engaging story-teller and his book is his gift to humanity. His message is as profound as it is simple: treat your body like it belongs to someone you love and with the right mindset, you can fulfill your greatest dreams.